Here's a better picture. 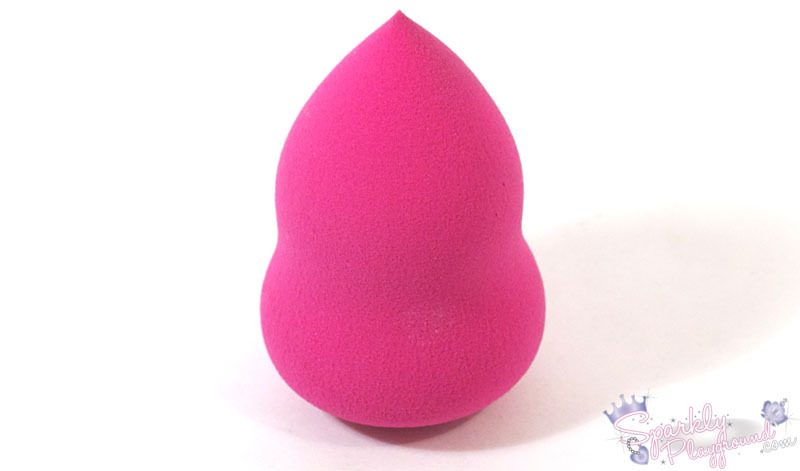 I can't go into too much detail as to how it compares to the Actual Beauty Blender but I think for the price I paid for. It's definitely worth trying out. I had a pretty good time using it and I just like it sooo much! I'm usually a brush person so trying out the sponge was like a whole new experience. It took me a few times to get it right but I really do love using this. A tip is to wet the sponge with some water before using it because it certainly makes a difference when it comes to applying your foundation. Cleaning wasn't too bad, I just used my regular make up brushes cleanser. A little more tedious than washing my brushes but I think it's the same amount of work comparing to my other regular sponges. I've been using it for about a few months now and it's in pretty good shape so far with a little bit of stains. "HOW MUCH DID YOU GET IT FOR????" At this price, I feel like you have nothing to lose. That's less than a coffee, maybe a bottle of soda, a telephone booth call, okay this list can go on forever.